(0 Customer Reviews) | Write Review 4 issues per year The latest fashion collections, labels and eclectic beauty from around the world. NOI.SE interprets fashion through textured, sensual imagery by photographers from New York, London, Paris, Milan, Sydney and elsewhere. Resisting the often trite conventions of fashion and celebrity, our ambition is always to evolve the aesthetic of NOI.SE. To create a magazine which imbues its readers with a sense of anticipation. The latest fashion collections, labels and eclectic beauty from around the world. NOI.SE interprets fashion through textured, sensual imagery by photographers from New York, London, Paris, Milan, Sydney and elsewhere. Resisting the often trite conventions of fashion and celebrity, our ambition is always to evolve the aesthetic of NOI.SE. To create a magazine which imbues its readers with a sense of anticipation. The latest fashion collections, labels and eclectic beauty from around the world. You'll receive 4 issues during a 1 year NOI.SE magazine subscription. 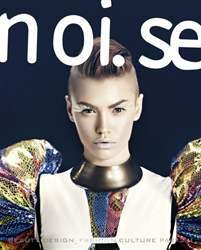 You'll receive 4 issues during a 1 year NOI.SE magazine print subscription.